According to the Independent UK, a new company has set its sights on using drone technology to replenish the vast devastation humanity has wrought on our forests. The BioCarbon Engineering company intends to turn the tide of tree terrorism, which currently has us killing 26 billion trees per year while only replanting 15 billion. First, the drones map out detailed plans of attack for their intended tree terrain, doing recon over farms, plantations, and other areas in need of refoliating. 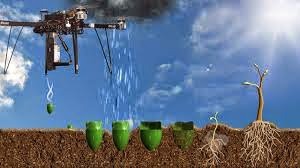 Then, once the drones have selected their tree-able target, they hover several feet above the ground, firing pre-germinated seeds into the soil. The seeds are protected by a nutritious hydrogel that will aid their growth, which makes this system markedly more effective than the practice of simply scattering dry seeds. Then, as the trees take root, they are continuously monitored via drone. BioCarbon Engineering CEO and former NASA engineer Lauren Fletcher explained, "The only way we're going to take on these age-old problems is with techniques that weren't available to us before. By using this approach we can meet the scale of the problem out there." Fletcher believes that two operators manning multiple drones could plant as many as 36,000 trees per day, and all at a fraction of the cost of traditional hand-sowing. He hopes to be using these former dealers of death-from-above to help save the world, starting as early as this fall. So if you see drones busting caps in some poor barren farmland, don't worry...these field maneuvers aren't for anything evil, and will hopefully someday spawn a forest. TREES ARE THE BOMB! Fletcher poses with one of his "Drones For Good."